Want the right email program to open when you click an email address in Chrome? Wish web-based email (such as Gmail or Outlook.com) could be the default? Find out here how to change the default email program in Google Chrome—even to a web-based email service. To measure cloudiness, the sky is divided in eight parts. 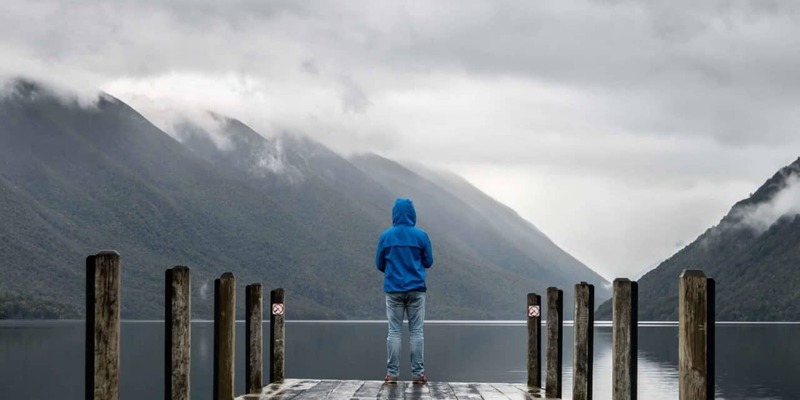 With every part that is filled with clouds, cloudiness increases by 1: a clear sky is 0, partly cloudy is, say, 4 and a completely covered sky would be 8. So far, so good. Then, of course, there is cloudiness 9. Yes, that means the sky is more than completely covered—because you cannot even see the clouds through the fog. So, cloudiness 9 means the sky is obstructed from view by fog. Now, the default email program is typically a choice between Outlook, Mail, Spark and similar desktop programs. Except, of course, when you need not even see the email program from Google Chrome because the browser itself—a web-based email service such as iCloud Mail or Gmail in it—covers the email program needs. If you had set up a web-based email service as the default in Google Chrome (see below), it will be replaced with the operating system’s default program. You can always switch back to the web-based service by making Google Chrome your default email program across the operating system. Click the hamburger menu icon (⠸) in Google Chrome. Direct link: You can also go to chrome://settings/handlers directly to open Handlers settings. Make sure Allow sites to ask to become default handlers for protocols (recommended) is enabled. Note: If this setting is disabled, it will read Do not allow any site to handle protocols. Click the hamburger menu icon (⠸) next to the desired service under email. Tip: If the service you want to use does not yet appear under the list, see below for adding it. Select Set as default from the menu that has appeared. If the service you want to use is listed under Blocked, click the × next to it. Now open the email service you wish to use in Google Chrome. Example: To add Gmail, open https://mail.google.com, for instance.
) in the address bar. Tip: You can add web-based email services to Google Chrome even if the service handler icon does not show; see below. Make sure Allow is selected under Allow ___ to open all email links?. 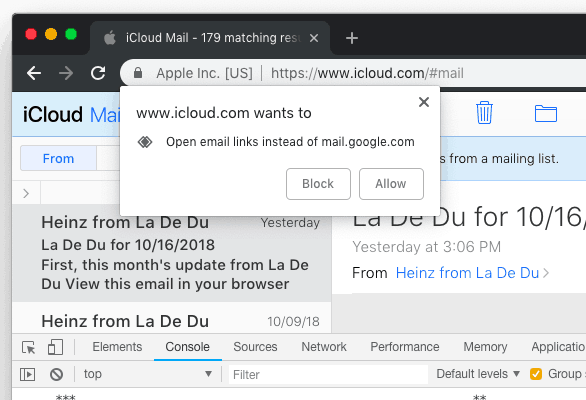 This will automatically make Google Chrome the default email program and the selected email service open with a new message when you click an email address. I do not see the service handler icon for my favorite email service. Can I manually add a web-based email service to Google Chrome for use as the default for email links? Open the email service you wish to use by default in Google Chrome. Click the Google Chrome hamburger menu icon (⠸). Select More Tools | Developer Tools from the menu that has appeared. Keyboard shortcut: You can also press Control Alt I (Windows and Linux) or Command Option I (Mac). Important: Replace [URI] with the link to compose a new message in the email service. In the link, %s will be replaced with the email address on which you click to start an email so the addressee is already entered. Note: Make sure the domain for the URI corresponds to the domain currently open in Google Chrome; e.g., if you are on https://www.icloud.com, the URI needs to start with https://www.icloud.com. 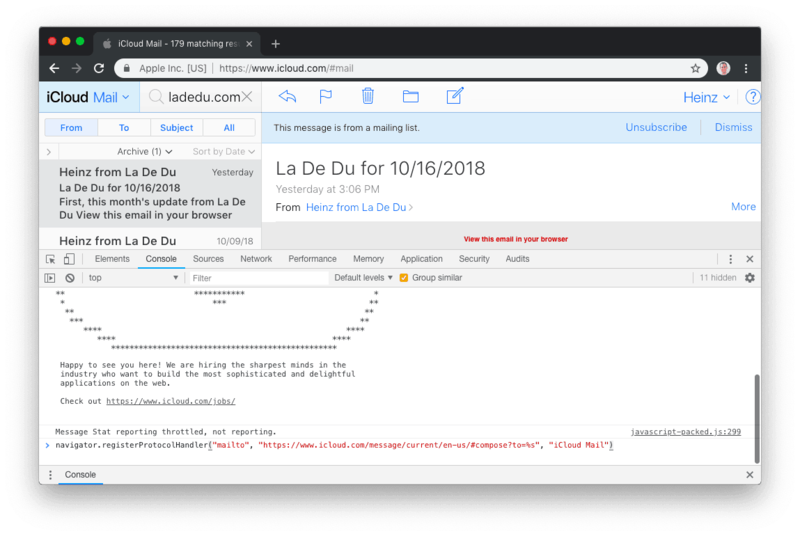 Example: The address for iCloud Mail to start a new email is “https://www.icloud.com/message/current/en-us/#compose?to=” followed by the email address, so the whole URI for use in the command is “https://www.icloud.com/message/current/en-us/#compose?to=%s”. Tip: Replace [Name] with the email service’s name. Example: Use “iCloud Mail” for iCloud Mail. Under __ wants to Open email links instead of ___ (which appears below the address bar in Google Chrome), select Allow.